Is it the single plane or Double plane balancing? With above information, you will be able to witness the test and verify test report. Let's start with an example. 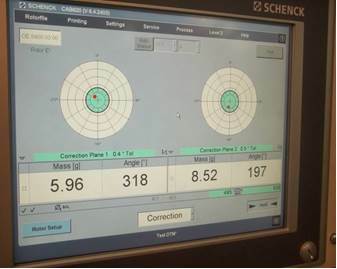 You are attending to the pump manufacturer to witness an impeller dynamic balancing test. You review approved test procedure and find the following information. The technician continues working on the grinding and balancing the impeller and run the machine several times and collects the data. See following for final run. So this time the amount of unbalance in both planes are less than 0.001 oz-in and pump impeller dynamic balancing can be approved. The inspector does not need to perform this calculation since the calculated value is provided in the approved procedure.